Rich Media: The eBook contains approximately 60 'pages' (each one actually a wide-screen 'spread'), as well as many photos in high-resolution format. 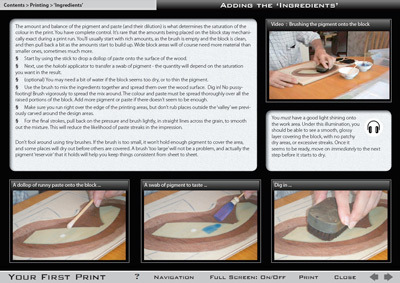 In addition to the standard text+illustration material, it also contains numerous audio and video clips showing every important stage of the printmaking process. 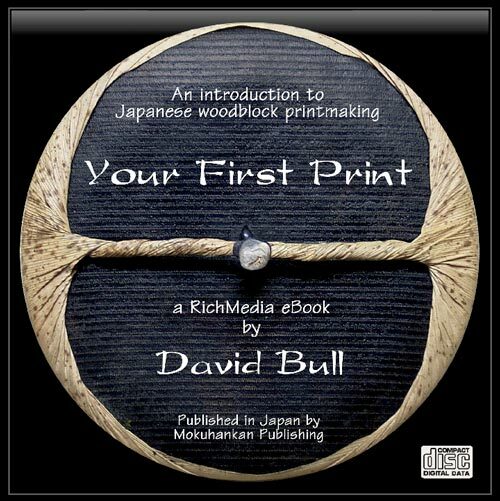 From David's introduction: "In recent years, there has been an explosion in the amount of material available to the person who wants to learn about Japanese woodblock printmaking. Both on the internet and in printed books, the beginner has access to so much information that it can be difficult to know where to start. That is where this book comes in. Remembering back to the days when I was first exploring this craft, I have created the book that I desperately wanted back then, but which didn't exist - a book that included everything that I needed to know. I have tried to create a highly practical and focussed guidebook that will take you - step by step - completely through the process of creating your first print, answering (hopefully) all the questions you will ask along the way." basic content (text and images) same as the download version, but images are higher resolution, allowing full-screen 'zoom in' for each one. requires Adobe Acrobat Reader 9 for proper viewing (see system requirements below). 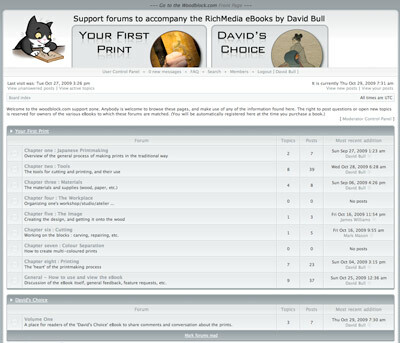 includes membership (posting and discussion privileges) in the 'Your First Print' support forum. a complimentary link to the downloadable version is also provided (immediately after purchase), so you can begin reading while waiting for your CD to arrive. all owners of the book have free upgrades to all future download editions. Each time a substantial update appears, an email with a fresh download link will be automatically sent to the address you gave when first purchasing the book. all owners of the book may order a CD of the latest edition at any time for whatever the Upgrade price at that time is. Please note that new CDs will not be pressed for every incremental update, just for major edition changes. Wholesale pricing: If you are a printmaking teacher running classes, or operate a retail outlet for printmaking supplies, please inquire about wholesale prices on the CD version of this eBook. System Requirements: Integrating Rich Media into a pdf file is a relatively new technology; you must have Adobe Acrobat Reader (version 9 or better) to be able to access the audio and video components of the book, as well as an internet connection (the Rich Media streams on demand, as you browse the book.) The Acrobat Reader is free software, and can be downloaded from the Adobe website here. 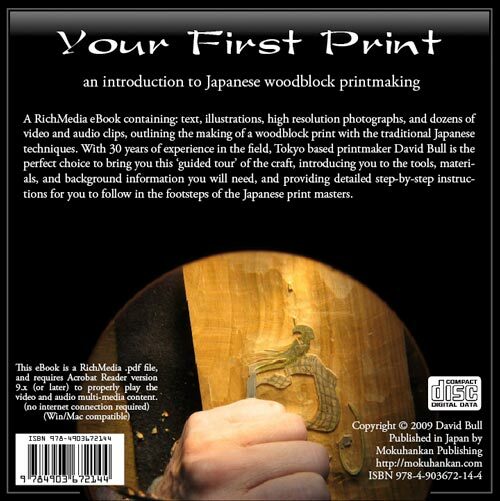 More information on this Mokuhankan RichMedia eBook - the format, how to use it, and other relevant details, can be found on this page. Note: this book was created in the pre-tablet era, and was built using Adobe's technology in order that it would be useable on both Mac and Win systems. Because of this, it will not function (completely) on the iPad, which uses no Flash. The text and images will be viewable, but none of the multi-media (audio and video) will play on the iPad. Sample Download: A sample containing 24 pages from the book (including a number of audio and video clips) can be downloaded by clicking here. It is a 7.5Mb 'zip' archive file, which should easily open in your computer (Mac or Win) to reveal the enclosed pdf file, along with a READ ME file. (Nothing else is included in each download, just these two files.) Please give it a try! "An amazing work. Your presentation is impeccable as usual but I am totally floored by the professional design and technical meticulousness! ... I sat down this morning and couldn't 'put it down'. It is an excellent amazing achievement." "Absolutely FABULOUS! 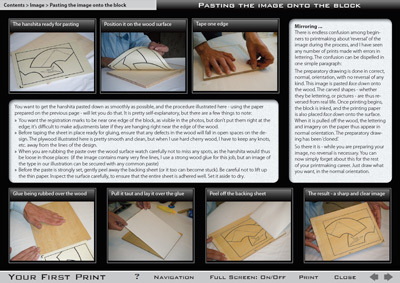 ... even veterans of MANY prints will find some very useful information and technique. ... THANKS SO MUCH for doing this!!!" "This book is absolutely STUPENDOUS! 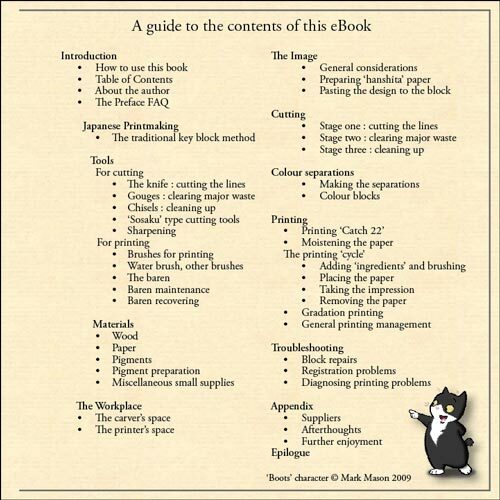 Even though you've called it 'Your First Print,' carvers and printers at ANY stage of their profession will find it incredibly useful." "This is an outstanding, first-class innovation in publishing. Your usage of the available technology is masterful. You have re-defined the concept of 'textbook'." "... this eBook format you decided to use offers wonderful opportunities that are impossible to achieve with a regular 'analog' book. The video clips and audio clips all not only help to clarify what you are trying to explain, but also give the book a very nice personal touch (the latter especially applies to your audio clips)." "... a state-of-the-art rich media e-book the likes of which I haven't seen... :-) BRAVO!!!" 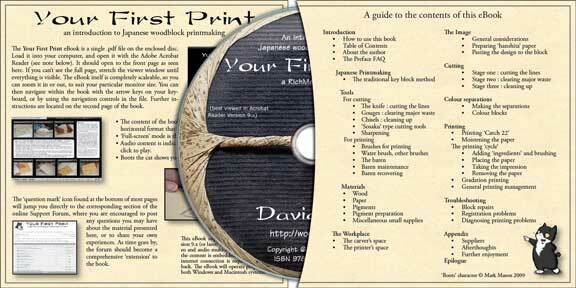 "You will be astounded by the beautiful presentation. You will learn. You will make better prints." "I have been reading and re-reading your wonderful book, and I am just finishing a print that represents a great advance in technique, mainly because of your fine teaching. I like most of all the audio portions of the book--it is as if we are sitting together sharing a cup of tea and you are warmly reminiscing and reflecting on the pleasures of your work in an endearing way." "I am blown away by the detail. The video and photos are absolutely super! 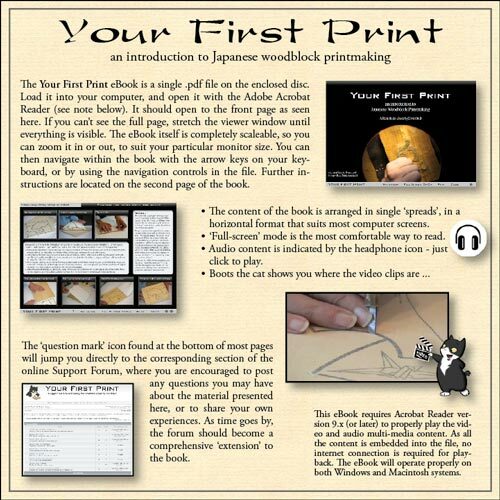 I believe that a person having no knowledge about Japanese Woodblock would be able to walk away from this cd and be able to actually print a block! What a remarkable achievement."